Today kicks off yet another MyShingle profile series, this time From Lawyer to Legal Tech Founder. Here, we’ll be profiling lawyers starting businesses in the legal tech space. Our first profile features Krista Andrews , a North Dakota based practicing family attorney and co-founder of PartUs – a collaborative, cloud-based platform that allows family law attorneys to create, exchange and update financial worksheets, discovery and other documents with clients and opposing counsel in family law cases. I stumbled across PartUs accidentally as a result of receiving a blind press release in my email and by chance, I followed the link to the PartUs home page. Though I don’t do family law, the streamlined design and usability captivated me and so I asked Krista if she’d provide the back-story — which is an incredible inspiration for lawyers who have an idea for a tech company, but lack a background in tech. Please tell us the name of your company and what it does. I am co-Founder, PartUs (www.partus.com), a cloud-based software that streamlines the divorce process by dramatically improving the efficiency of creating and negotiating divorce agreements. I am also a Shareholder and Firm President at Anderson, Bottrell, Sanden & Thompson, specializing in family law. 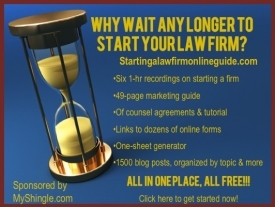 Prior to your current position at your company, how long did you practice law and where? What was your area of practice? Do you still currently practice? In addition to co-founding PartUs, I’m still currently practicing law, and have practiced law for 20 years in North Dakota and Minnesota. I specialize in family law and am also a mediator and collaborative law attorney. What gave you the idea for PartUs? I knew that I wouldn’t be able to eliminate the difficult emotions involved in divorces, but I’ve found that when I provide my clients with direction and identifiable tasks they are better equipped to proceed with their divorce and are empowered to make better decisions. I felt that an attorney’s role in a divorce was obviously very important, but that there were things clients could do to more meaningfully participate in their divorce, if the tools were available to them. I was also frustrated about having to take so much time building an asset and debt inventory or monthly budget, when my clients were in a better position to do so (with my input and oversight). One of my other frustrations with the process was when I would attend mediation and often spend hours just trying to get on the same page with the opposing party with asset and debt inventories and substantiating those values. Everyone was frustrated with simply reconciling financials, before we even started digging into settlement! I want to ask you specifically about the steps from idea to implementation. First, once you had the idea, did you take any steps to validate it? Second, after you decided to go forward with PartUs, how did you find developers and how long did it take to get the site up and running? My “techie friend” and co-founder, Tim Brookins, one day jokingly said that I should create a divorce app. My wheels started turning, and I began running the idea and the features I was considering including in the app by friends, colleagues, clients, judges – you name it. The response was overwhelmingly positive, so I continued to pursue the idea. With input and additional suggestions, I continued to “pivot” with my ideas for the app. A former client thought it was such a great idea that he invested $100,000. So, I contacted a local company to create “wire frames” (a black and white sketch of what the software would look like) for the app and obtain a cost estimate. The cost for the “MVP” or “Minimum Viable Product” was going to run around $500,000+ to build. (As a side note, I am NOT techie and I am risk-averse, so being a tech entrepreneur is a cruel fate for me!) I was down to about $90,000 in funds by this time, so I went back to my techie friend and asked him to review the bid, to determine if the costs were appropriate and whether I could somehow reduce the initial build to fit into my budget. Tim reviewed the bid and asked to meet to review the MVP and bid. He thought that what I was intending to do with the software was a “game changer” and wanted to be involved in the process. Tim is a Distinguished Engineer at Microsoft, and a coding genius. Tim coded PartUs in a few short months, and we started trying out the software with my clients and local attorneys. Based on their input and suggestions for new features, we again continued to work out any minor bugs that we encountered and add features that our users thought would be valuable. Within the span of about a year, we went from the initial idea for the app to a product that was gaining users rapidly. After the software was functional and we continued to add features, we worked with a company to develop the name, logo, messaging, color palette, etc. We then worked on developing our website, and establishing Facebook, LinkedIn, and Twitter accounts. We currently have around 1,000 users in about 15 states and two countries! Tim is currently working on the app version that can be downloaded in the App Store, as we currently have the web-based version only right now. How long has PartUs been in operation, and what has the response been so far? So let’s talk about your product. In your view, what gap does PartUs fill in the market? It speeds up the divorce process and creates huge efficiencies. It allows parties and attorneys to electronically negotiate cases and easily share information. It provides a history tracker of proposals. What are the benefits that PartUs provides and what distinguishes PartUs from other products already on the market? PartUs allows for much greater client involvement, assuming their attorney gives them “can update” access. If their attorney chooses though, they can simply allow their client “read only” access to the worksheets. There are currently four worksheets on PartUs: “document collection” (where clients can upload various documents their attorney requests, i.e. standard discovery documents) and the attorney can then share this information with the opposing attorney; “asset and debt allocation” (where clients can build their asset and debt inventory, allocate, and attach documents and comments to support each line item) and the attorney can then share this allocation and supporting documentation with the opposing attorney in a click of a button; “monthly budget” (where the client can input their monthly budget and attach documents to support their budget) which can again be shared with opposing counsel in the click of a button; and “exhibit list” (where attorneys can save their exhibits and a PDF exhibit list is easily created). When a worksheet is shared or published to opposing parties they can “copy” the worksheet, and make changes – i.e. 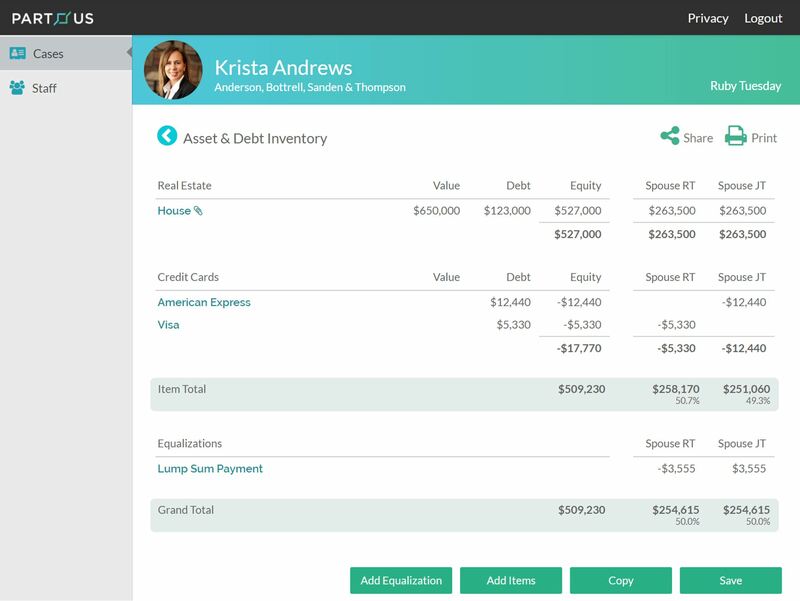 add assets, change a value, change an allocation, and change property equalization amount. When more than one proposal has been made, users can “compare” any proposal with a single click and the software will red-line only those changes, modifications, or deletions that were made by the opposing attorney for simple review of the proposal differences. And a history tracker is then created of all past proposals! What are your goals for PartUs? Where would you like the company to be three years from now? I would love nothing more than for PartUs to be the standard divorce software used by attorneys and clients, and to hear that the software has made divorces just a little less painful for everyone involved. I would be thrilled if in three years, we would have 20% of the divorce population using PartUs. I’m finding that as a tech entrepreneur, you do it all. I’ve worked with my business partner in providing feedback and direction on the software, gathering data on what clients and attorneys want in the software, and what works and doesn’t in “our world”. I’ve met with marketing companies, trained judges, lawyers, mediators and clients on the software, and tried to figure out how to post something on LinkedIn. (Remember, I’m not techie!). I’ve ordered vendor materials for conferences that we’ve attended and stuffed goody bags for attendees. I don’t think there is a typical day as there are so many different things that always need to be done, which has certainly kept me challenged and forced me out of my comfort zone! How does your training and experience as a lawyer help you in running your company? My training and experience as a lawyer has helped with general business matters such as setting up an LLC, handling corporate matters, and dealing with the types of issues common to small businesses. There are so many issues that are relatively easily addressed because of my training and experience as a lawyer, and I feel I would be in a completely different position without that background. Do you think that coding experience is beneficial to lawyers who want to start a legal tech company? What skills do you think are most important? I would never want to attempt trying to code what has been done with PartUs, as I’m told that the coding involved was incredibly complex. Without Tim’s experience and if I would have had just some coding experience, it wouldn’t have become a reality. It might be helpful to have some experience though to better understand the complexities involved, as I call Tim my “magic legal fairy wand” and I have come to regard adding a new feature as easy as just telling him what I want next in PartUs – at which point he may often need to explain that some of my suggestions are not as easy to implement as I think. In terms of running a tech company, I think that perseverance and really listening to all feedback that you receive are the most important skills that a legal tech entrepreneur can have to succeed. What are some of the differences between running a tech start up and running a law firm (or working at a firm)? Running a law firm and a startup, both involve a variety of daily issues that need to be addressed, but I find that running a tech company presents a much greater variety of daily issues to address. As a tech start up, we are very “lean” with staff, so we become jack-of-all-trades. On the other hand, I joined a very established law firm over ten years ago, so most of the structure was already in place and the issues therefore aren’t as diverse. With a tech start up, I’m creating something that can really help a lot of people and can have a global impact. Although I’m also helping people in my law practice (hopefully!) I often feel like my job is more reactive than proactive. What was the biggest challenge for you in transitioning from law practice to your current position? Trying to still juggle them both! As PartUs continues to grow, I find that I need to delegate more in my practice and take fewer cases. For now, I feel that continuing to practice keeps me sharp and gives me insight into understanding what our customers want from the product. Do you have any formal training in technology or “hot” technical skills (e.g., programming, product development, data science) and are these skills necessary to build your company? Nope, none at all, whatsoever. In fact, here’s a quick story to tell you how “hot” my technical skills are: when we were first testing PartUs I was having an issue accessing the software. Tim asked me what browser I was using. I asked him what a browser was, and he said “its what you click on when you want to use the internet.” I proudly told him that I had “a blue E”! Its a double-edge sword working with me: if I can figure out the software and use it, anyone can. I’ve told Tim that all along: I don’t want software that you need to train me on, or that I can’t intuitively figure out. But when I don’t know what a browser is, I’m sure Tim is wondering what he got himself into when partnering with me! If another lawyer was interested in starting a tech company, what advice would you have? Stay the course, and don’t get discouraged when attorneys don’t change their ways overnight. Change is hard for a lot of people and creating new technologies that change the way we do business isn’t a simple matter, but if you feel strongly that what you are creating is really for the greater good, you’ll have success. The 5-minute pitch on Shark Tank isn’t how quickly success is realized in the real world either. There are long hours, days, weeks, and months ahead but keep on, keeping on. What excites you most about the future of legal technology? Creating positive change. When a client says, “thank you – I could sleep a little better last night” then I know I’m doing something right, and legal technology can help us accomplish that for many people. See more Lawyer to Legal Tech Profiles.